"This is entirely unfair. Well apparently you can't get a job in this town unless you can do something." Once again, Lucy believes that her dancing talents should get her a chance in Ricky's show. After unsuccessful practices with the fleet-footed Fred, Ethel finds her a French dude to help with the dancing. However, his constant romantic advances create a problem for Lucy. Eventually, Ricky agrees to fight a duel with pistols with the avid courter. Although a few points are silly, including Lucy's attempts to hide the French guy, the overall tone is pretty boring. This episode rates 2.5 out of 5 hearts. Ricky is hosting a charity benefit, and Lucy desperately is hoping to find a way to become involved. Her singing voice is utterly attrocious, but Ricky tries to find a way not to tell her this fact. So he figures out a way to involve her in a joke-telling number. Predictably, Lucy discovers his scheme and turns the tables in the finale. This conclusion is clever, but on an overall scale, this is just another routine entry. This episode rates 3 out of 5 hearts. After splurging and buying an expensive dress, Lucy wants to prove to Ricky that she can earn money too. She discovers an oddly lucrative babysitting job that pays $5.00 per hour, but there is a catch. Instead of just one crazy boy, there are two twins that torment Lucy. They also perform an amateur act that requires Lucy's assistance at the last minute. The boys' tactics are fun, and they lead to an enjoyable show. This episode rates 4 out of 5 hearts. Lucy's neighbor Miss Lewis is an older woman who provides a big surprise by proclaiming her love for a businessman who works in the apartment building. 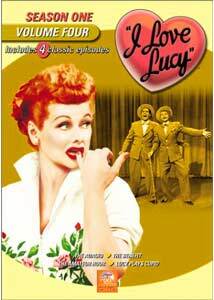 Lucy tries to get involved and help the shy woman, but the guy actually states his love for Lucy. Everything possible is done to fend him off, but little works and leads to a frustrating experience. While fairly charming in an odd manner, this entry is only mediocre. Image Transfer Review: Similar to the other I Love Lucy DVD volumes, this release offers a clear transfer that provides a significant improvement over any VHS versions. The picture does contain some minor defects due to its significant age, but they cause few major problems. The full-frame, black-and-white images are clear and generally effective. Audio Transfer Review: This disc also includes a mono transfer that matches my initial expectations for this type of release. The dialogue and music are both clear and easily understandable, which is all you can really want from this type of audio track. The sounds are very centralized, but they lack the muddled nature sometimes evident on older television transfers. Extras Review: This volume offers slightly less extras than its predecessor, but it still includes several notable features. The most interesting is the entire My Favorite Husband radio show for the Valentine's Day episode, which inspired this series' Lucy Plays Cupid entry. It stars Lucille Ball and Richard Denning as Liz and George Cooper in a fairly generic sounding radio sitcom. Also included is a three-minute behind-the-scenes featurette entitled "Rehearsing the Pilot." It contains a reading of the initial ideas for the show and also presents some production photographs. The remaining supplements include the series' original Philip Morris-dominated opening, a guest cast list (with bios), and several minor flubs. I Love Lucy: Season One, Volume Four should definitely please the show's many devout fans who will immediately purchase every available release. However, it never moves beyond conventional entertainment. There's nothing particularly bad about these episodes, but they mostly lack the extra touch needed for great comedy. With the exception of some silly moments in The Amateur Hour, the included episodes are only moderately successful.